On September 17, 1796, George Washington delivered his now famous Farewell Address in which he cautioned that “it is our true policy to steer clear of permanent alliance with any portion of the foreign world.” This policy of “no entangling alliances,” as it became better known, was to be the dominant theme of American foreign policy for the next one hundred and fifty years, right up to the start of World War II. At the same time, the fledgling Philadelphia Mint was preparing to manufacture a new denomination, the quarter dollar, authorized by the Mint Act of 1792. It would eventually be recognized and accepted throughout the world. It is difficult to imagine today how seriously coinage was regarded two hundred years ago. Officials understood that once coins left the mint, they would become metallic emissaries of the new nation. This is why so much attention was given to gold and silver coins weighing exactly what they were supposed to weigh, no more and no less. Most educated people of the day understood that a poorly designed coin would reflect badly on their country, just as a handsomely designed coin of proper weight and fineness would be respected worldwide. The design of the 1796 quarter dollar had its genesis in the almost universal dislike for the previous coin designs. Earlier copper coinage, such as the Chain cent and Wreath cent, had not been well received by the public, and the Flowing Hair design of the silver coins was widely criticized. To avoid such public embarrassment with the new design, Mint Director Henry DeSaussure engaged renowned portraitist Gilbert Stuart, who supposedly used as his model the prominent Philadelphia socialite Mrs. William Bingham (nee Ann Willing). The likeness of the buxom Mrs. Bingham was first applied to the Draped Bust dollar issued late in 1795. But all did not go well in transferring Mrs. Bingham’s likeness into coined form. The rather bland portrait that ended up on the quarters of 1796 did not resemble the beautiful model that Stuart sketched. In fact, Stuart was so disappointed with the results that his connection to these coins was forgotten for almost a hundred years. It was not until 1887, when an article in the American Journal of Numismatics was published, that collectors became acquainted with this fact. The failure in transferring Stuart’s sketch into coinage can be laid at the feet of one Robert Scot. Scot was a banknote plate artist who the Mint hired as an engraver. It was later found out he could neither sink a die nor make a device punch. Given Scot’s incompetence as well as that of his assistant, John Eckstein, it is a wonder the coins turned out as well as they did. The obverse of the Draped bust quarter features Stuart’s portrait, encircled by 15 stars, with the inscription LIBERTY above the head and the date below. The reverse depicts a small eagle on cushion-like clouds, within a wreath of olive and palm branches. The inscription UNITED STATES OF AMERICA encircles the wreath. Only 6,146 of the new quarters were struck in 1796. There are just two varieties known, one with a low 6 in the date and the other with a high 6, the Low 6 variety being much the rarer of the two. Collectors generally want only one coin for a type set, and herein lies the enduring popularity of the 1796 quarter. While it is not a particularly rare coin for the era, anyone who attempts to complete a type set of United States coins must have a 1796 quarter, as this design was made in only this one year. The next design type (not coined until 1804) retained the draped bust design on the obverse but replaced the small eagle of 1796 with the heraldic eagle then current on the other silver coins of the day. The 1796 quarter dollar is one of the few United States coins whose value is greater than its population would indicate. Decades of publicity and the need for the ‘96 quarter for type sets has kept its price high relative to other series and individual rarities. Its reputation and value has even inspired counterfeiting. Very convincing counterfeits surfaced at the 1982 A.N.A. convention in Boston. These are cast copies of the rare Low 6 variety. They are copied from a low grade genuine coin, but all show the same field marks in front of the face—a nick just left of the 12th star, a nick above ER in AMERICA and another on the final A in AMERICA. When grading a 1796 quarter, look for wear on the obverse on the highest points of the hair above the forehead, followed by the shoulder and bust line. On the reverse, friction is first seen on the breast of the eagle and next at the top edges of the wings. Even on the finest specimens, head detail is likely to be flat on the eagle. This is not due to die wear, but rather design opposition caused by the eagle’s head being directly opposite the shoulder of Liberty on the obverse. Adjustment marks are also common on these early silver coins. These were created by filing the planchets prior to striking to reduce the weight of the coined product. In this rather crude way, the Mint made sure that each gold or silver coin had exactly the amount of precious metal stipulated by law. The 1796 quarter dollar was created with great care and considerable effort, and while the coins that were produced fell short of some people’s expectations, this one-year type coin has attained popularity with a broad base of collectors that few other United States coins can equal. In modern times, the quarter dollar has established itself as a workhorse in the United States coinage system. It plays a vital role in turning the wheels of commerce, and its annual production routinely tops one billion. By contrast, the quarter was all but invisible during the early years of federal coinage. The United States Mint delayed its introduction until 1796, making it one of the last U. S. coins to debut. Then, after striking just 6,146 examples of that date, the Mint suspended production of 25-cent pieces for nearly a decade. In large measure the early public indifference to this now-essential coin was attributable to the fact that Americans didn’t need it at that time. The Spanish two-reales piece, which circulated widely in the infant United States, had exactly the same purchasing power—25 cents. Then as now, people tended to favor things (including coins) with which they were more familiar. Under the circumstances, there was no particular urgency to strike quarter dollars at all, as evidenced by the fact that from 1796 to 1814, a period of nearly 20 years, the Mint produced quarters for only five dates and in quantities totaling barely half a million pieces. Indeed, the paltry output in 1796 seems to have been intended primarily to establish the denomination’s existence—just to show the flag, so to speak. U.S. coin designs underwent frequent changes during the nation’s formative years and, because of its late introduction, the quarter dollar missed the very first cycle in this process: Unlike the dollar, half dollar and half dime, the 25-cent piece never appeared with the Flowing Hair portrait of Miss Liberty. By 1796, the Mint had already replaced that design with a new Draped Bust likeness of Liberty. A small, naturalistic eagle, much like the one on the Flowing Hair coinage, continued to grace the reverses of the first Draped Bust issues. This included the quarter dollar of 1796, which turned out to be a one-year type coin. After completing the minuscule mintage of the first U.S. quarter, Mint officials seemingly forgot about the 25-cent denomination. It didn’t reappear in the nation’s coinage lineup until 1804, and by then the “small eagle” of the first silver coins had given way to a larger, heraldic eagle based on the Great Seal of the United States. The Draped Bust image of Liberty is essentially the same in both series and was fashioned by noted portraitist Gilbert Stuart, possibly at the urging of President George Washington himself. It’s said that Stuart’s model was Ann Willing Bingham of Philadelphia, a socialite regarded as one of the most beautiful women of her day. His sketch was converted to plaster by artist John Eckstein of Providence, Rhode Island, and coinage dies then were executed by Mint Chief Engraver Robert Scot. Stuart reportedly felt that the execution was more akin to the type performed by a hangman, killing off the artistry of his portrait. For that reason, he disavowed his connection with the design. In his highly regarded book Numismatic Art in America, Boston museum curator Cornelius Vermeule likened the Draped Bust figure to “a buxom Roman matron.” Her long, elegant tresses are tied back with a ribbon, and ample cleavage is visible above a fold of drapery in her gown. This right-facing portrait is encircled by LIBERTY above, the date below and stars along the left and right borders. On the Small Eagle quarter of 1796, the obverse displays fifteen stars, one for each state in the union at that time. By 1804, the Mint had settled on 13 stars representing the original states; the notion of adding a star every time a state joined the union had been scrapped as an impractical indulgence. 13 stars appear on the reverse of the Heraldic Eagle quarter, as well, tucked into the space above the eagle’s head. There are clouds above the eagle, while UNITED STATES OF AMERICA and 25 C. are inscribed around the periphery. A shield is superimposed upon the eagle’s breast, a banner in its beak proclaims E PLURIBUS UNUM, and it grasps symbolic items: a sheaf of arrows and an olive branch. In designing the coin, Chief Engraver Scot chose to place the warlike arrows in the right (or “dexter”) claw and the olive branch of peace in the left (or “sinister”) claw. This reverses the traditional American priorities, since the right claw is dominant in heraldry and thus more properly suited for a symbol of peace, not war. The Draped Bust/Heraldic Eagle quarter remained in production for only four years, and during that time its annual mintage never reached a quarter of a million. Only 6,738 examples were struck in 1804, making that the key date of the series. Thereafter, the output topped 100,000 every year, reaching a high of 220,643 in 1807. Combined production for all four years totaled only 554,899. Mint records make no mention of proofs. Heraldic Eagle quarters are exceedingly scarce in mint condition and all but unheard of in grade levels above Mint State-65. Areas on this design to first show wear are Liberty’s bust and shoulder and her hair above the forehead. On the reverse, check the eagle’s head and the tops of the wings. A complete date-and-mint set actually includes five coins, since 1806 quarters come with both a normal date and a 6-over-5 overdate. Although it wouldn’t be an impossible task to assemble a set of all five issues, many prefer to treat this as a type coin and acquire just one high-grade example to represent the series as a whole. For those quarter devotees who prefer complexity to simplicity, Ard W. Browning published the first variety study of these coins in 1925. His pioneering book has been superseded by a much better researched and illustrated 2008 volume by Steve Tompkins, though the Browning numbering system is still employed today. The American political experiment spawned many liberation movements throughout Europe, as people naturally embraced the idea of the right to self-determination. It began with France—first with the Revolution in 1789 and again, after the fall of Napoleon, spreading to Naples, Greece, Belgium and Poland. As the old Spanish Empire crumbled, the Latin American Republics were also created in this spirit. The chaos in Europe attracted many immigrants to the dynamic, energetic and relatively peaceful United States. One of these was John Reich, a German engraver caught up in the Napoleonic Wars. He paid his way to America through indentured servitude and pursued his calling as an engraver by applying for a job at the U.S. Mint in Philadelphia. He was hired in 1807 and was immediately given the task of creating new coinage designs. Reich brought Europe to America. His obverse design shows Liberty facing left, surrounded by thirteen stars, with the date below the bust. Liberty is quite buxom and, though characterized in the press as looking like “the artist’s fat mistress,” she is probably representative in appearance of the typical woman that Reich would have seen in Europe. Contrary to the opinions of some students of United States coinage, she is not wearing a Phrygian liberty cap but simply a mob cap, with a band inscribed LIBERTY. Many took issue with the idea that Liberty would be adorned with a cap given to freed slaves, but even President Thomas Jefferson saw this headdress, with its high cap bearing frills and ribbons, as familiar wearing apparel of women during this time. The bucolic Miss Liberty was quite different than the stern, no-nonsense look of Robert Scot’s preceding Draped Bust design. The reverse shows an eagle with outstretched wings perched on a branch and holding three arrows, the Union Shield on its breast and the motto E PLURIBUS UNUM (“One made up of many”) on a scroll above the eagle. The legend UNITED STATES OF AMERICA and value 25 C appear around the border. The eagle is more domesticated and peaceful looking than the aggressive Heraldic Eagle of the 1804-1807 design and more robust than the puny eagle on the 1796 quarter. The Reich design would follow the policy established by the first director of the Mint, David Rittenhouse, that one design would be used on all coins of the same metal. It was first rendered on the half dollar of 1807, the dime of 1809 and finally the quarter dollar in 1815. There were no quarters minted from 1808 to 1814, primarily because there was little demand for them. Early quarters were victims of Gresham’s Law. This economic axiom dictates that if two competing currencies exist side by side, the least valuable will be spent and the other will be kept. In other words, “bad” money drives out “good.” The competing Spanish two-reales coins were legal tender at par with the heavier quarter, so the quarter coin was either hoarded or melted for its silver content. The Spanish coins satisfied the needs of commerce, so there was not much need or motivation to make large mintages of United States coins. Quarters were only minted in 1815 because the banks had ordered them. In fact, the majority of the mintage of 1815 went to the Planters’ Bank of New Orleans. Just over 89,000 pieces were made, including approximately 20,000 pieces delivered on January 10th of 1816. A fire at the mint the next day destroyed much of the equipment, shutting down production of quarters until 1818, but nobody missed the coin. Though the design was criticized, it represented a technological improvement over the Scot Heraldic design. There were far fewer design elements that had to be worked in by hand, reducing the time necessary to make a working die and increasing its useful life. The dies and therefore the coins were more consistent, making it easier to detect counterfeits. Relatively low mintages were the rule for this series, with production for the eleven years totaling only 1,290,584 pieces. While VG to VF pieces are easily obtainable, uncirculated pieces are scarce or rare. Assembling a complete date set is precluded by the two major rarities, 1823/2 and the proof-only 1827, but strong demand comes from type collectors. Proofs, really presentation pieces, exist for some dates but are very rare. The 1827 proof issues have a special significance in that they are associated with the name Joseph J. Mickley, who is considered to be the “Father of American Coin Collecting.” On a visit to the Mint in 1827, Mickley obtained four proof quarters, which turned out to be at least a third of the entire mintage for the date. Although Mint records show 4,000 quarters were produced in 1827, undoubtedly they were struck with another date, as no 1827-dated business strikes are known. After coin collecting became popular in the United States in the 1850s, about a dozen surreptitious restrikes were made of the coveted rarity. The restrikes were made from the original 1827 obverse die, but the reverse used an 1819 die with a flat base 2 in 25 C. instead of the curled base 2 of the original 1827. There is also a mystery surrounding the Capped Bust quarter. There are pieces, mostly dated 1815 and 1825, that have a large “E” or “L” counterstamp above Liberty’s head. They were first noticed by collectors in the 1870s and were thought to have official origins, possibly as some experiment, but official records show no such counterstamped pieces. The puzzle remains unsolved, though Walter Breen conjectured in 1982 that they could have been made for use as school medals, using the “E” for English and “L” for Latin. Uncirculated pieces must be free of any trace of wear at the hair above the forehead and over the ear. In addition, check the drapery on Liberty’s bust and shoulder. On the reverse, the eagle’s head and the tail feathers below the shield are the high spots. Some examples come weak or unevenly struck, and this should not be mistaken for wear. The ending of the large size Capped Bust quarter series in 1828 nearly coincides with the end of the first Philadelphia Mint. The cornerstone of the new mint building was laid on July 4, 1829 at Juniper and Chestnut Streets. The anticipation of the new mint was an opportunity to refresh the designs of the coinage. In 1831, a smaller size Capped Bust quarter was introduced, which kept the basic Reich design but eliminated the motto E PLURIBUS UNUM. The diameter was reduced to 24.3 millimeters, the size the quarter would remain up through the present day. After a generation of warfare ended in Europe in 1815, it can be said that the Western world truly entered the 19th century, a century that stands in retrospect as the most remarkable period of material progress in the history of the human race. From the beginning of history until about 1800, the work of the world was largely done by hand tools. Since then, it has been done by machines of increasing sophistication. In the 1820s and ‘30s, several important scientific advances were made that were the foundations of later, important technological achievements. Beginning in 1831, Charles Darwin boarded H.M.S. Beagle and began gathering the information he would later use in his theory of evolution. Charles Babbage attempted to build a calculating machine in 1833 that was too advanced for the technology of the time, but his theories formed a basis for later work in this field. In 1830, Joseph Whitworth developed the standard screw gauge and a machine that could measure to one millionth of an inch, which made possible the production of more precise machine tools for planing, gear cutting and milling. In the first three decades of production at the Philadelphia Mint, there was very little change in the methods used to strike coins. While steam presses had been discussed by Mint officials since the 1790s, coins continued to be produced by the old screw presses that were powered by either human or animal muscle. Then, in 1829, several mechanical improvements were made in the striking of half dimes, but it would not be until 1831 that these same procedures could be incorporated into the production of quarter dollars. At that time, a device known as a “close collar,” or more precisely a “collar die” was used, which confined the planchets at the time of striking and at the same instant reeded the edge of the coin. This “close collar” imparted what Mint Director Samuel Moore called “a mathematical equality” to the quarters so produced. A higher, beaded border was also incorporated around the rims which served to protect the interior surfaces of the coin. Director Moore used these mechanical improvements to also make several changes in the previous Capped Bust design. The first change Moore ordered Mint Engraver William Kneass to make was to eliminate the scroll above the eagle with the traditional motto E PLURIBUS UNUM. It was Moore’s belief that the motto, which translates from Latin as “One made up from many,” was redundant; the legend UNITED STATES OF AMERICA was already on the coin, and this signified the same concept. The elimination of the motto was somewhat controversial in government circles, and Treasury officials sought to restore it, but Moore traveled to Washington to press his case for its elimination. Moore prevailed and the motto was not restored to quarters until 1892, with Charles Barber’s redesign of that year. Kneass reworked the entire coin. He retained the “sandwich board” eagle of John Reich’s previous design, with its union shield displayed on the bird’s breast. 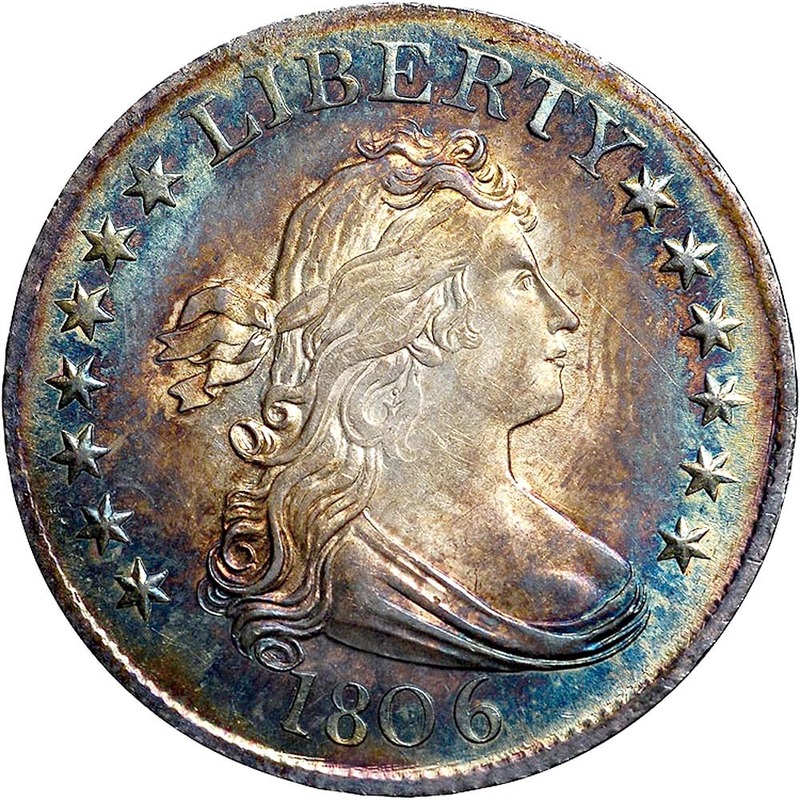 The obverse kept the same figure of Liberty facing left and wearing a mob cap, but Kneass tightened the design, giving the coin a more cameo-like appearance. He also deepened the devices, resulting in better striking qualities. Small size Capped Bust quarters were struck in only eight years, with a total of 4,202,400 pieces produced. All were struck in the Philadelphia Mint between 1831 and 1838. There are no major rarities in the series, but the 1832 and 1836 issues are considerably scarcer than other dates in mint condition, while 1831 and 1834 are the dates most often seen. The 1831 issue comes in Small and Large Letters varieties, but each is of approximately equal rarity. Because these quarters were made for such a short time, the series is one of the few of the 19th century that can be completed by the average collector. However, relatively few complete date sets have been assembled over the years, perhaps because Bust quarters in general are largely overlooked and underappreciated by collectors. The series can also be collected by die variety. While there have been several references published over the past fifty years that list the die varieties on quarters from 1831 through 1838, collecting the series in this manner has not caught on as it has with other denominations such as half dollars, dimes and cents. In general, small size Capped Bust quarters are sought out as type coins. In problem-free AU and mint condition, they are surprisingly scarce, with most survivors grading XF or less. Proofs are known from each of the eight years in this series, but they are great rarities. These coins were struck decades before proof coinage was made available to the general collecting public, and proofs were minted either on demand for favored collectors or for presentation purposes. Only two or three proofs are known in certain years, and all are significant numismatic items. Small size Capped Bust quarters wore evenly as a result of Kneass’ redesign, and the raised rim assured minimal loss from circulation. On the obverse, friction first begins to show on the highest points of the hair above the eye, at the top of the cap and on the stars. On the reverse, the eagle’s talons and the arrowheads will show wear first. 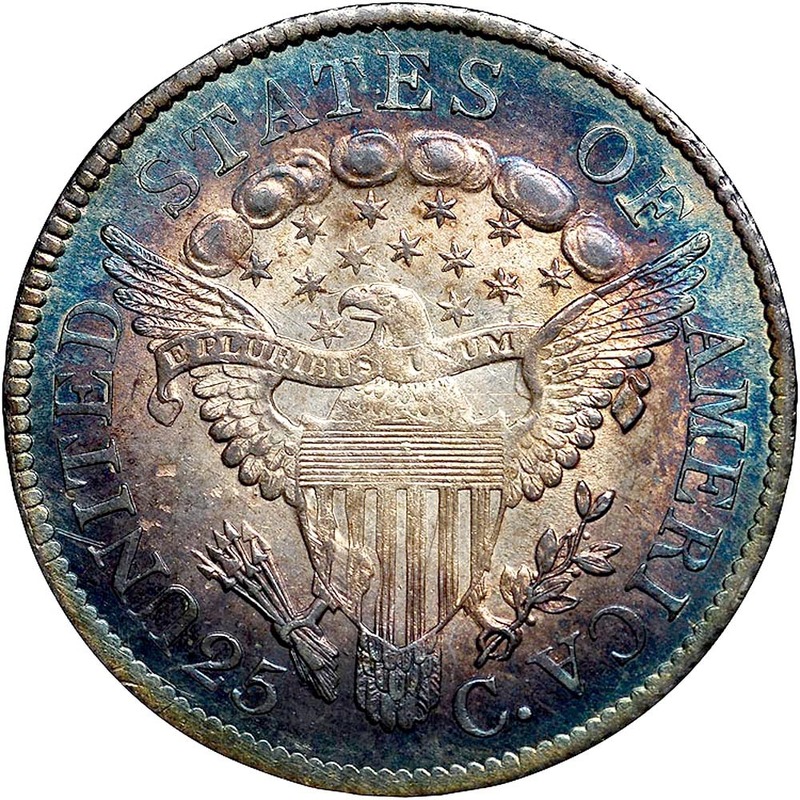 The Kneass-designed quarter dollars of 1831-38 can be viewed as a great success from the viewpoint of the mechanical advances they incorporated, and they are certainly one of the best examples of the U.S. Mint’s entrance into the “modern” era. While the design was a reworking of John Reich’s previous edition, its revised elements gave the coin a slickness that is certainly an artistic improvement over the original concept from 1815. The technical merits of the coin are especially noteworthy, with the innovative close collar giving the quarters a precise, uniform appearance that would (with the advent of the steam press) be later imparted to all U.S. coins struck after 1836. Although almost “state of the art,” the series would end abruptly in mid-1838 to begin preparation of dies for Christian Gobrecht’s new Seated Liberty design, which would go on to be issued for the next half century.